Have you ever wondered that how a beautiful website attracts many customers? Designing form an outline and turn it into a beautiful website around different devices. 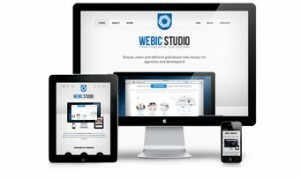 Over 5 years of experience in creating Responsive Website, Webic Studio believes in improving visiting ratios and maximum traffic. Our created websites look beautiful around each device. Approximately, every new customer these days wish to have a mobile version for his or her website. It is almost important after all: design for the IPhone, BlackBerry, IPad, and all screen resolutions must be matchable. In an upcoming five years, we will probable require to design for a number of extra creations. When will the insanity stop? It will not, sure. In the area of Web development and design, we are speedily growing to the fact of being unable to continue with the never-ending new devices and resolutions. For various sites, making a website account for each declaration and new device would be not possible, or as a minimum not practical. Should we just undergo the penalty of losing users from one device, for the advantage of gaining users from another? Alternatively, is there another choice? Responsive Web design is the move toward that suggests that design and development should react to the visitor’s performance and background based on monitor size, stage and orientation. The action consists of a blend of flexible networks and outlines, pictures and a smart use of CSS media problems. As the visitor’s moves from their laptop to iPad, the website should mechanically change to hold for decree, picture size and writing abilities. In a different way, the website should have the skill to automatically react to the visitor’s choices. This would get rid of the need for a dissimilar design and development stage for every new device on the market.